Turning Vision Into Action: It's May - Time to Reflect and Renew ! As you head into mid-May it is time to Turn Vision Into Action in 2011-2012, through serious examination of progress on your practice this year. And that reflection needs to be done now while you are tired and while you are still connected to the work, the pace, the expectations and the frustrations of this past school year. One of the areas of our work was Daily Lesson Design Protocols. What is the school or District's vision for that design, what are the daily non-negotiable teaching behaviors that meet that design and on what basis should all teachers and administrators reflect on that design as a learning team. We talked about the case for designing meaningful professional development throughout the year by working as part of a Professional Learning Community (PLC) Team. I shared this cartoon that illustrates the power of great solutions that can result from meaningful professional discussions about teaching and learning gaps for progress in 2011-2012. 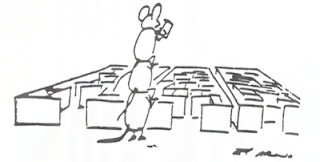 In this next section, the 3 mice get together, hold a collaborative learning team meeting and discuss how to "Make it" through the school year! How can they erase inequities caused by private decision making regarding student task selection and learning experiences? Then together, they come up with an interdependent plan! And suddenly the vision for their work is much clearer and focused. Think back and reflect on the implementation of most lessons during 2010-2011. More importantly, on what Basis would you decide lessons could be better next year? How well did our students express their ideas, questions, insights and difficulties? Where are the most significant conversations taking place (student to teacher, student to student, teacher to student) in our classrooms? How approachable and encouraging are we - as our students explore? Do students see each other as reliable and valuable learning resources in our classrooms and through our daily lesson design ? Here is a quick and efficient end of the year activity for you and your team. Each teacher and Administrative team member should complete the 5 questions, with a percentile ranking and a rationale for the ranking. For each grade level or course based Team which of the following Vital Behaviors is predominantly true. Cite the level of implementation by everyone on the team (an equity issue if some are implementing and others are not). Place an X in the appropriate place on the line. 1. The Team designs and collectively implements an agreed upon Unit (Chapter) by Unit set of student learning outcomes – that include high cognitive demand tasks for all students. 2. The Team designs and implements agreed upon prior knowledge skills to be taught during each lesson of the Chapter or Unit. 3. The Team designs and implements agreed upon lesson design elements that ensure students are engaged in the learning and construct viable arguments, critique the reasoning of others and attend to a precision with the language – every day. 4. The Team designs and implements agreed upon lesson design elements that allow for student led summaries of the daily lesson expectations. 5. The Team designs and implements agreed upon lesson design elements that include the use of technology for developing student understanding and rigor. My thanks to Debbie Delozer, Denise Walston, Susan Birnie, Ruth Harbin Miles and others in VCMS, for allowing me the chance to spend the day with Virginia's mathematics leaders. For the powerpoint presentations (as pdf's) click here morning and here for the afternoon sessions. I hope the information will be of support to your work.